Synopsis: Baby Doll’s (Emily Browning) mother dies leaving her and her little sister in the hands of her abusive stepfather (Gerard Plunkett). The stepfather finds out that the girls are to inherit his late wife’s fortune. Determined to get his hands on the money he kills the younger sister and blames Baby Doll. He incarcerates her in the Lennox House for the Mentally Insane run by Dr Gorski (Carla Gugino) and bribes an orderly Blue Jones (Oscar Isaac) to take care of her and make sure she can’t tell anyone what he did. She retreats into a fantasy where she and the other patients are hookers trapped in a brothel by Blue Jones who makes them dance for the customers. When Baby Doll dances she goes into a deeper fantasy realm where she finds a Wise Man (Scott Glenn) who helps her to formulate a plan to escape the institution/brothel with the other patients/hookers. I did not really like this film. 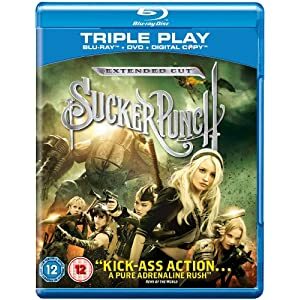 Just like Zack Snyder‘s other films it has a lot of style and is often stunning to look at but the most stunning elements that take place during Baby Doll’s dance routines are like watching someone else playing a computer game. There are all sorts of armies of mooks for the women to slaughter including orcs, robots and, best of all, steam-powered German soldier zombies. then there’s the boss of the level for Baby Doll to kill. The problem is that the characters themselves did not seem any more real than game characters. The imaginative style of the film did not make up for the really corny, cliché dialogue. There’s a lot of music in the film, mostly cover versions of familiar evergreens. I didn’t hate the music but the film was relying on it a lot to create moods where the performances didn’t. I’m sure this film will have fans but it just didn’t make one out of me. Excellent review, hit the nail on the head. Really left me wanting more in terms of substance. Unbelievably bad film IMO. You have to wonder how Zack Snyder keeps getting work. People are still buying them. My nephew is watching it right now and I wonder what he’ll say when its all over?